In Colorado, a pop star and her entourage are brutally murdered. At first the lead assassin, ex-Navy SEAL Cyril Landry, has no qualms about the killings - it’s just another job for The Shop, a shadowy organization that has hired him to execute people across the country. But Landry begins to wonder why these people had to die, transforming from mercenary to hunter as he delves into the depths of The Shop. Thousands of miles away, in a seedy motel in Florida, a local police chief is found shot to death. As Detective Jolie Burke works to find out why, the tangled threads of evidence lead to a disturbing place: the heart of the powerful Haddox clan, led by US Attorney General Franklin Haddox. As Jolie pursues the truth, she quickly discovers that Haddox will do anything to protect his country’s ugly secrets - even kill. Landry’s quest to uncover The Shop’s motives throws him into the dark currents of Jolie’s investigation, and they find themselves working as an unlikely duo: a cop and a killer, joining forces to expose a shocking conspiracy that ascends to the highest offices in the land. 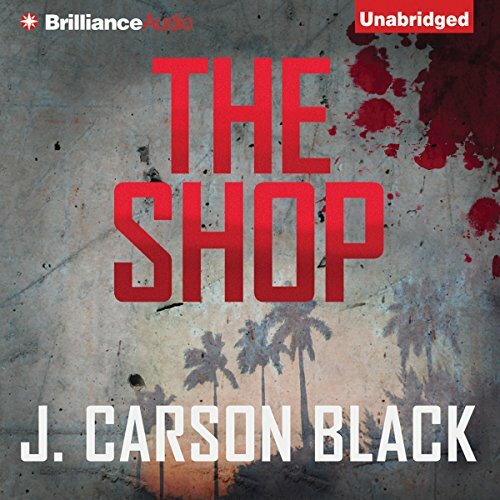 ©2012 J. Carson Black (P)2012 Brilliance Audio, Inc.
“The Shop” is will written with a many action scenes to keep the reader engaged but the story had some issues. First is that most of the characters aren’t really likable. Jolie is but she’s written in a way that seems to make he weak rather than a great heroine. The second is the plot is a bit scatter brain and confusing, so much so that when I got to the end I felt a bit jipped. There were very little clues leading up to it and the whole ending felt a bit unresolved. The narration was rather flat and while I thought it sounded as if Siri was reading this book to me my wife disagreed but did agree that it sounded electronic rather than an actual person. No. After 2 hours i was lost. Felt the reader was very monotone. I could not follow what was goign on. I am new to audio books so i am not sure it was the writing or the reader. What could J. Carson Black have done to make this a more enjoyable book for you? What didn’t you like about Donna Postel’s performance? Did The Shop inspire you to do anything?